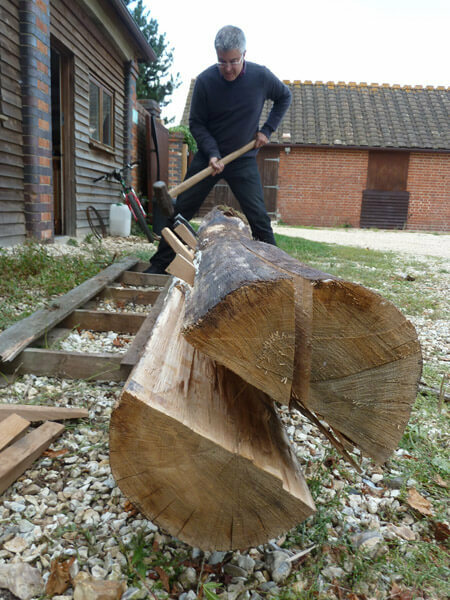 In 2011 I embarked on a collaborative project called ‘Common Places’ with Adam Zombory-Moldovan of ZMMA Architects, to research ideas for public art in Shaftesbury, Dorset. That ended in a rather ignominious heated public debate with an ex Lord Mayor of London, a well-known television archaeologist and an array of characters who played tennis together closing ranks to ‘save’ the town from modern art. 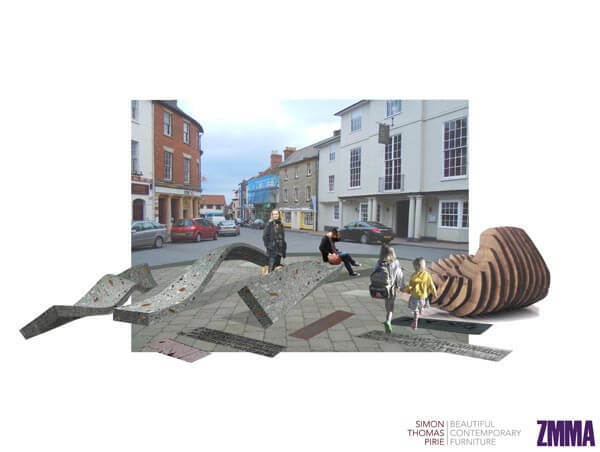 Although in the end the ‘Common Places’ project research did not lead to public artworks in Shaftesbury Town centre, the ideas did take physical form not so far away. We had been approached by Persimmon Homes through the project sponsors, North Dorset District Council and the Dorset Design & Heritage Forum, to look simultaneously at a site on the new East Shaftesbury housing development. This major expansion of the town had been contentious as they often are in rural locations. 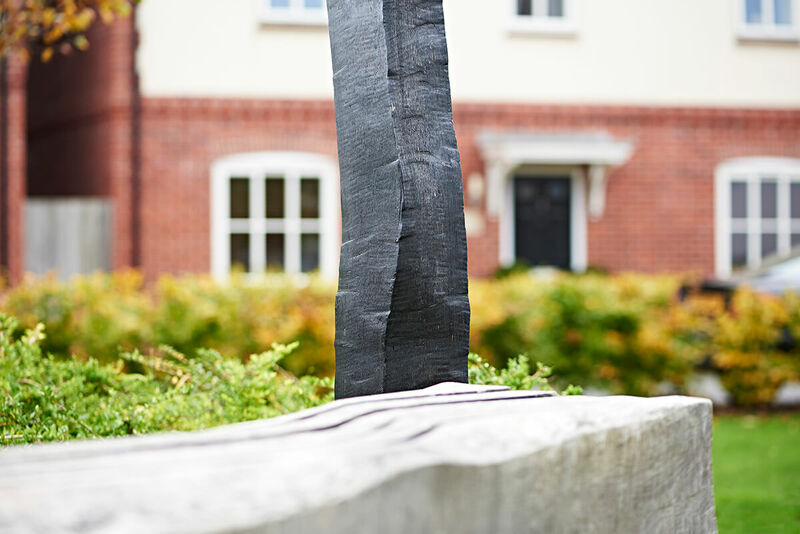 One of the many conditions of planning permission had been to integrate public art in various open spaces within the development to give the scheme more local character and individuality. 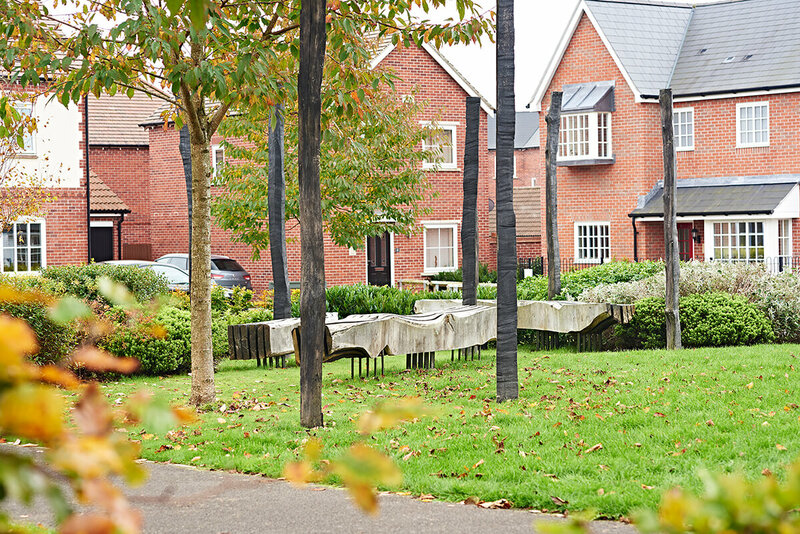 Initially we were asked to look at The Rickyard, a small open green space in the middle of a cul-de-sack of new 3 to 4 bed houses with a footpath running through the middle from corner to corner. This was part of an existing public footpath that connected the town to a network of roads and trackways (some very old) linking to other settlements and features in the landscape. It was partly this enforced juxtaposition of the new houses and the ancient landscape we were interested in exploring, but also use of local materials and the links to Dorset myths, sacred places and sight lines. We were really playing with the idea of sense of place and time. 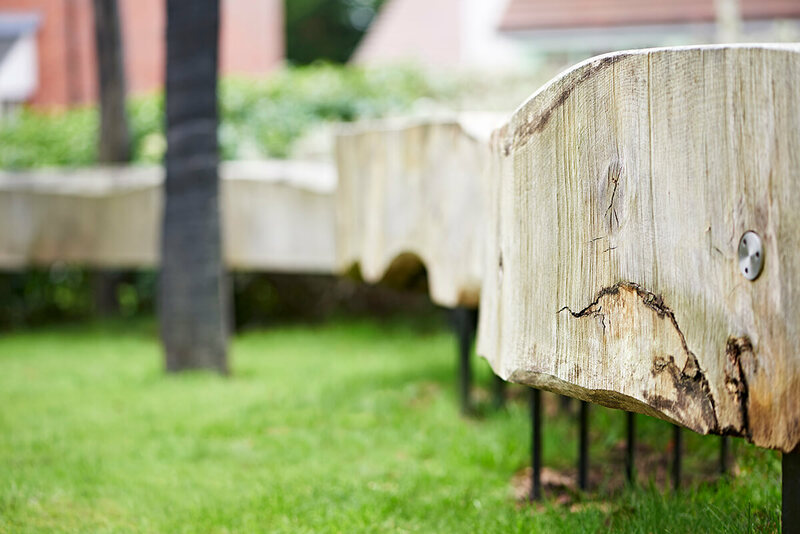 The Rickyard had been ‘landscaped’ in the way that new developments are planted – rather contrived; but all these developments have to start from something – and it doesnt take long for these new spaces to become imbedded as ‘place’ to the people who live there. So our job was to add some intrigue, meaning, focus and of course, somewhere to sit. 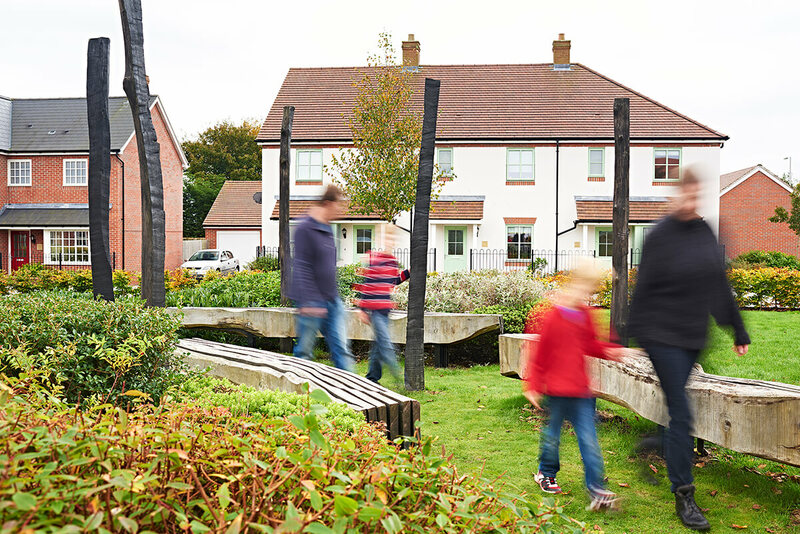 When the project included the wider remit of potential sites in Shaftesbury town centre the plan had been to make links using public art between these old and new communities, highlighting the old trackways into the market town with objects, markers and words. Now as a stand alone site these resonances are more obscure, but nevertheless The Rickyard is still hopefully a place to pause and contemplate old and new, time and place. In the world where cars transport you from your new home to work, or the supermarket, or a day out with the kids in comfort, arriving at a place is all too easy. The Rickyard is probably best experienced as a surprise encounter on a journey by foot, from the Saxon origins of the market town’s streets, through estates of houses from the post-war building boom, though the 70s low lying bungalows, the 80s red brick, the 90’s brown window frames, then finally into the latest offering from Persimmon Homes: The new ‘mini town’ with a ‘village’ feel and its patches of open public space (at least it has them), and this one has something rather different, even ‘unusual’ in it. Perhaps what is here has resonances with an even more ancient landscape that is all around but is not always obvious; the hill forts, burial mounds, ditches and features that are prevalent in this part of the world. ‘The Rickyard’ installation seen from the corners of the cul-de-sac where the public rights of way emerge into the space. 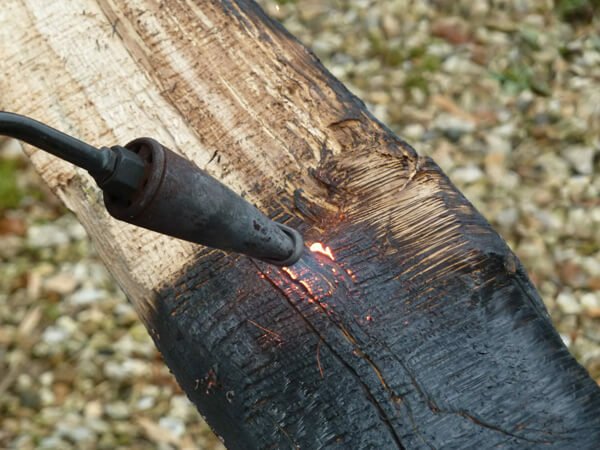 The scorched oak uprights serve to mark the way across the space. Our proposals also incorporated a hard pathway through the seating but this element is yet to be completed by Persimmon Homes. These public space projects take time to come to fruition. For various reasons 4 years past from the initial ideas to final installation. 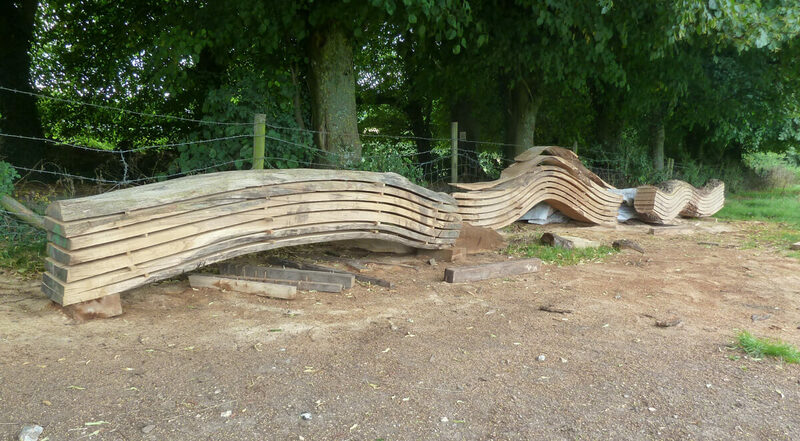 The completed benches remained at my workshops for 18 months before finally being transported to site in late 2015. Apart from the lack of resolution on the surface of the pathway through the seating and uprights (it’s not mean’t to be grass) The Rickyard is very much as Adam & I envisaged it in the early concepts. The Rickyard is maturing nicely now from the stark and barren site it started out as. The trees and shrubs have already grown significantly and the new build houses look lived in and loved. As modern developments of its type go, it looks like a nice place to live. I can imagine that when visitors come, the seating and uprights in the middle of the green come up as a topic of conversation. The residents I have spoken to really like their unusual centrepiece. It is part of their ‘landscape’ and their ‘place’ now. 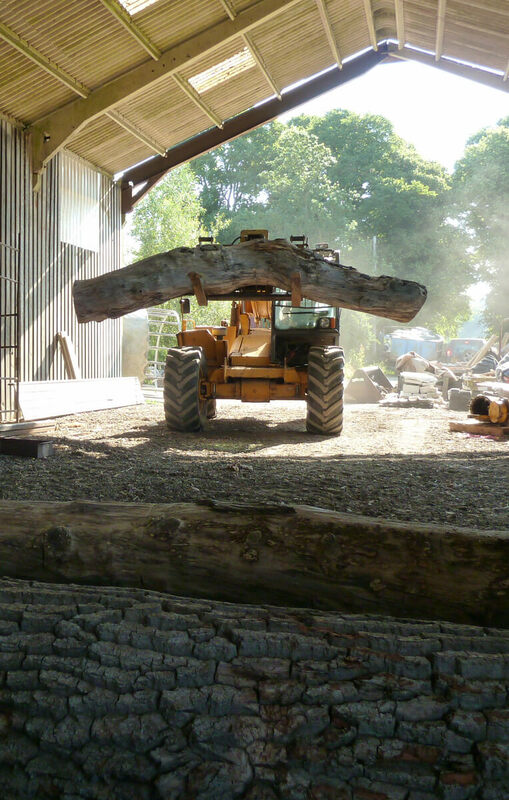 Textures of natural weathered oak logs against the stark scorched uprights. 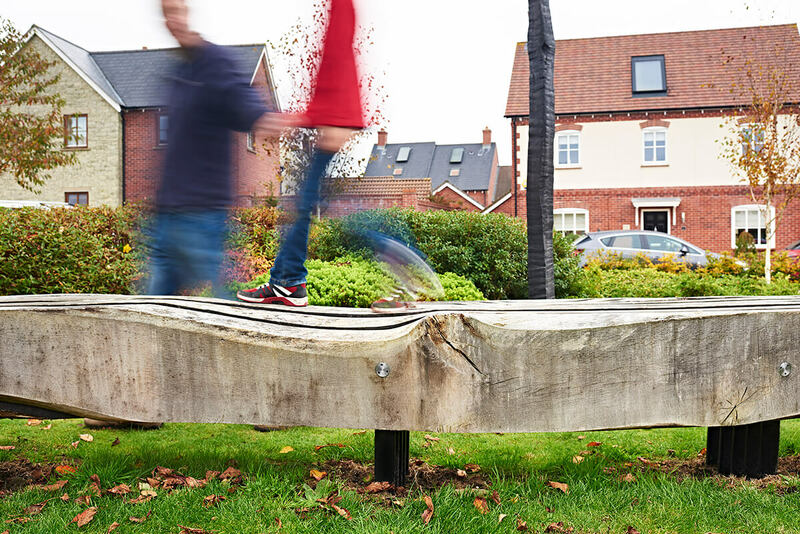 The benches are tied together with a beautifully engineered and vandal-proof stainless fixings. 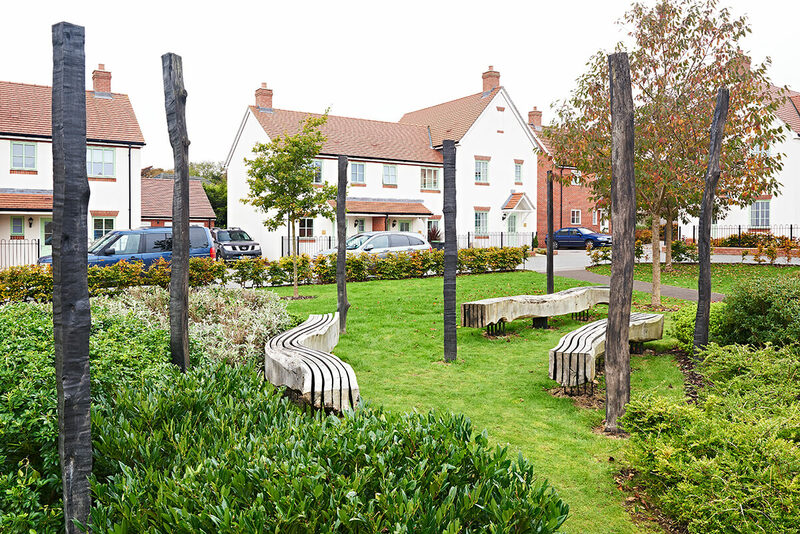 Like other public seating and artworks we have done I really enjoy going back occasionally, seeing it mature and if i’m lucky seeing a bunch of kids playing around it or a family chilling out for a moment on a walk through the development. 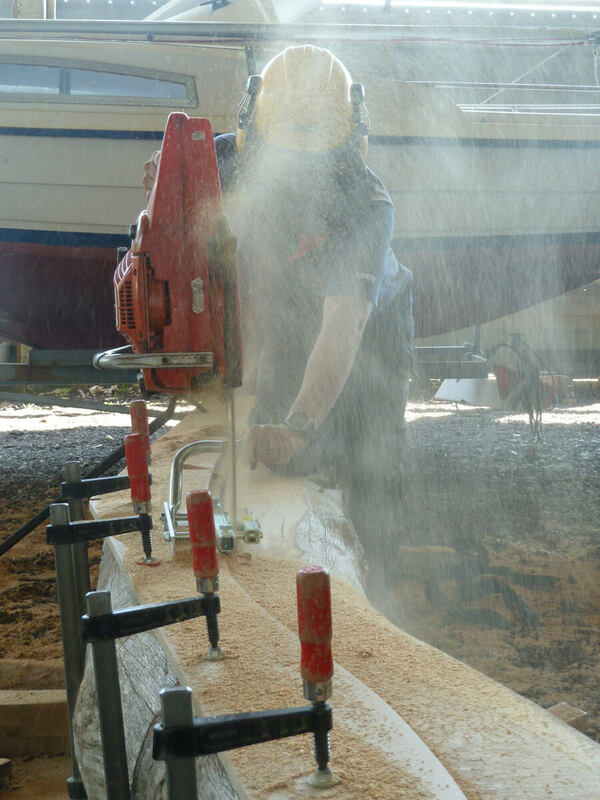 Part of the challenge Adam and I both enjoyed with this project was working with a major house builder. It would be fair to say they were engaged in a rather ‘arms length’ way and would probably not have chosen to put public art works on the site if it had not been a condition of planning. Indeed on the other site we worked up proposals for on the development, Mampitts Square, nothing has happened! I suspect the outcome there may be rather ordinary and ‘off the shelf’ in the end. Despite everything though, the Rickyard project got built and we helped create a new ‘common place’ for Shaftesbury where an ex Lord Mayor of London, a TV archaeologist, a couple of tennis players and I could partake in a good chinwag! Children defiantly get it! It’s something interesting to climb on or play around. If you’d like to talk to Simon about a public art or seating project please get in contact, initial conversations and ideas cost nothing. 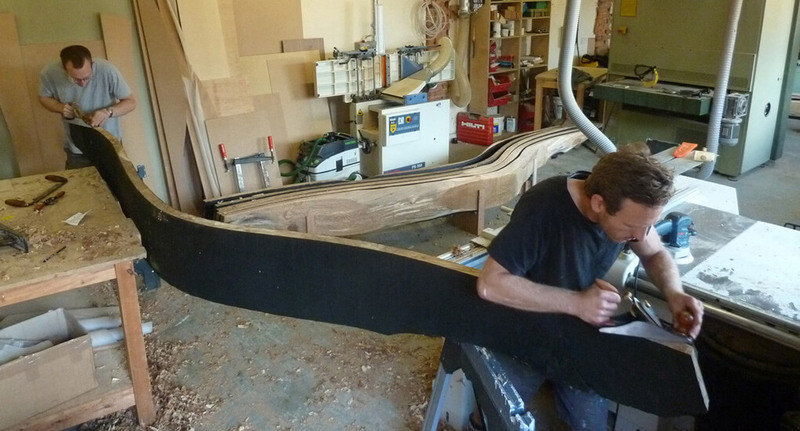 To view our Tudor Arcade Public Seating case study click here. To find the Rickyard yourself and explore old and new Shaftesbury click here for the Dorset Explorer map.